love, elizabethany: listen: i got to talk to gabby douglas! 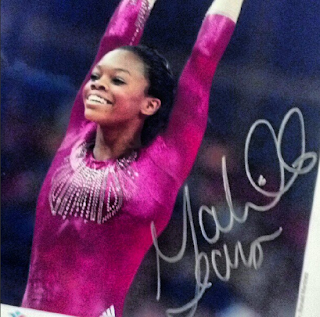 listen: i got to talk to gabby douglas! All my life I've wanted nothing more than to talk to an Olympic gymnast. I've had a couple of them as coaches for a week at camp, and I think I ran into Dominique Dawes one time unless that was a dream... but now I'm a professional! I can really talk to them! And I finally got the chance when Gabby Douglas called the station during Corey's show. Still, it was neat to talk to her, ask her about her schedule and growing up, and give her an opportunity to clear the air about the "trash talking" she did about her former gym. Corey's mad I asked her that question, but the people gotta know! Was she really treated as awful as she said? Seems like it... but it also seems like she's strong enough [or trained enough] to "move on from it." She's still a cute girl, and even though I've now had two awkward moments of time with her [I "met" her at an AT&T a couple months ago for about .5 seconds after hours of waiting], I think she's great and am totally rooting for her now and in Rio! ....even though she made me feel silly for choosing "real life experience" over gymnastics.